Welcome to Fresh Store Instant, we are really excited to have you join us on this new platform and we have a lot of exciting stuff planned for Fresh Store Instant. 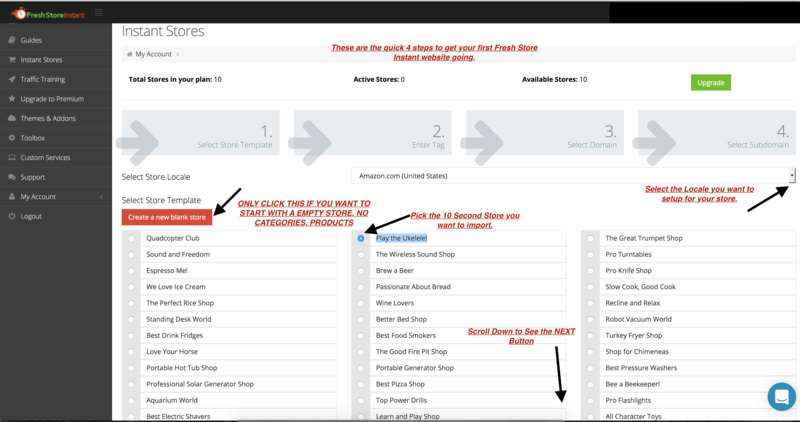 On the "Instant Stores" page, you will have the buttons shown in the image below. 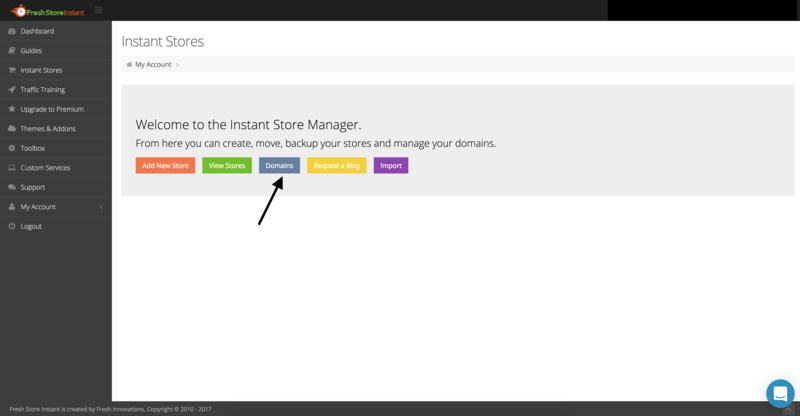 "Add New Store" = This is the button to add new stores using Fresh Store Instant. You can get started right away without a domain. 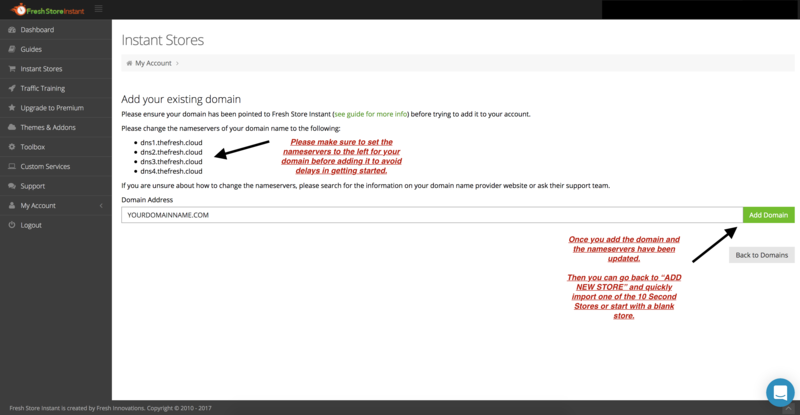 You can use one of our domains to setup a store on a sub-domain. "View Store" = This will show you all the current active stores you have. 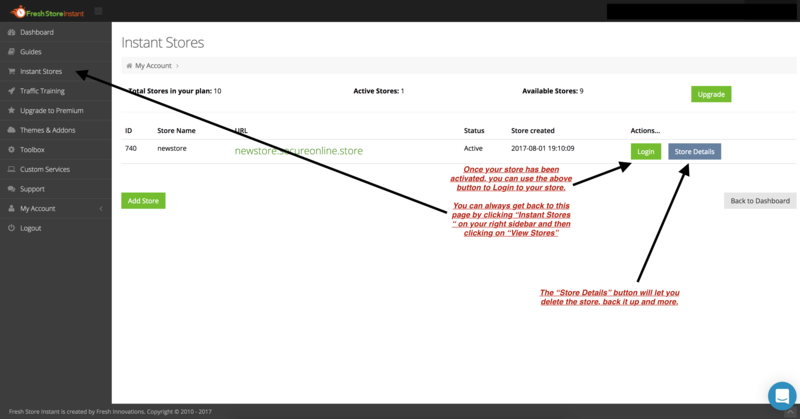 You will be able to Login to the store, back it up or delete it from the View Stores Button. "Domains" = The Domains button will allow you to add your own domains that you own or you can register a new domain to be used with your Fresh Store Instant websites. 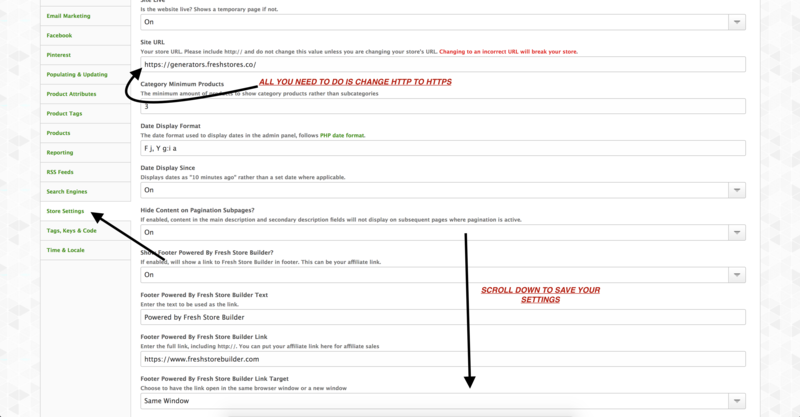 "Request a Blog" = If you would like to run Wordpress along with your FSB store. With this button you can put a request for us to install Wordpress for you in a sub-domain or sub-folder. "Import" = If you have a Fresh Store Builder store running on another host and would like to import to your FSI cloud hosting, this button will start the process. Now to the fun part, getting your first 10 Second Store setup. 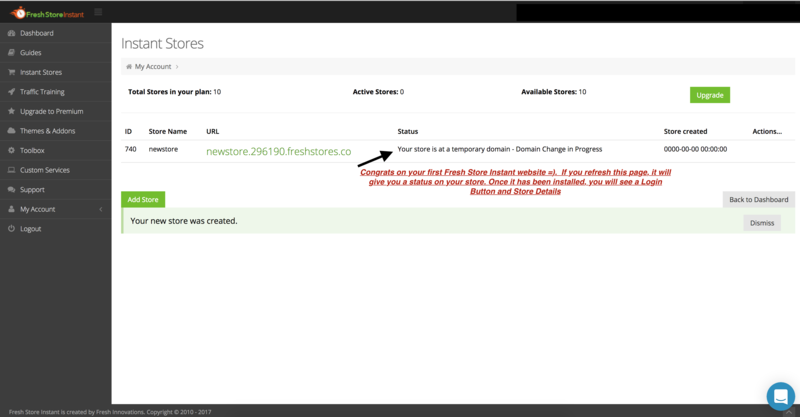 If you click on the "Add New Store" button, you will see the image shown below. It will take 4 steps to get your store installed. First you need to select a niche you want to use, then you will need to enter your amazon tracking id and the final step is to select your own domain to use or use one of our free domains and have a sub-domain created for that store. Make sure to enter your Amazon Tracking ID here, this normally ends in -20 or -21 depending on your amazon locale. If you don’t have a valid amazon tracking id, you can just put in amazon-20 for now and later change it in your Store Settings. 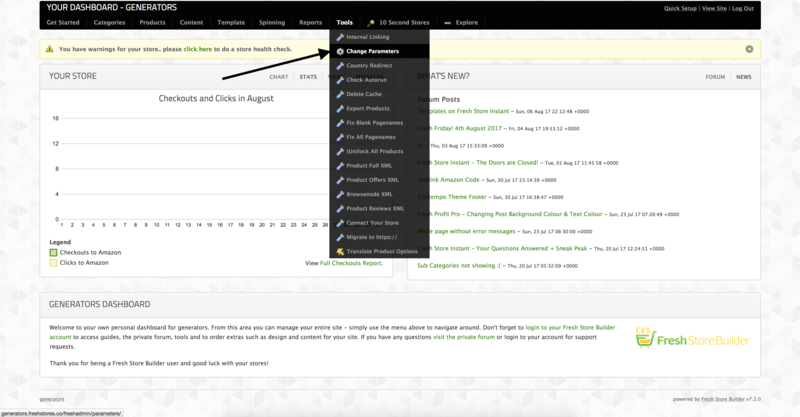 If you didn’t add any Domains to your Fresh Store Instant panel, then you can choose any of the free options above. You will get sub-domain created on the domain you select for free. You can later move this store to its own domain. Now you need to enter a name to use for the sub-domain. Click the final button "Make My Store"
If you would like to use your own domain or register a new domain for your FSI store, then you just need to go back to your "Instant Stores" page and click on the Domains Tab. If you own a domain already, click here to add it to your Fresh Store Instant Panel. 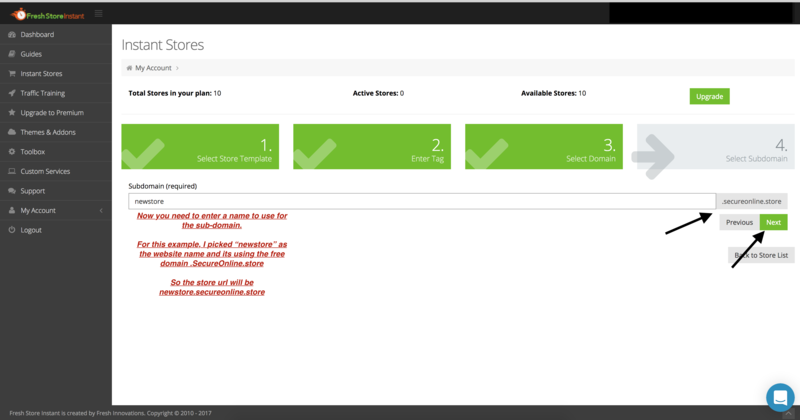 Once added, you will be able to run the NEW STORE module and setup a 10 Second Store on that domain. If you would like to register a brand new domain to use with Fresh Store Instant, click the “Register a new domain” button to get started. Please make sure to set the nameservers to the left for your domain before adding it to avoid delays in getting started. Once you add the domain and the nameservers have been updated. 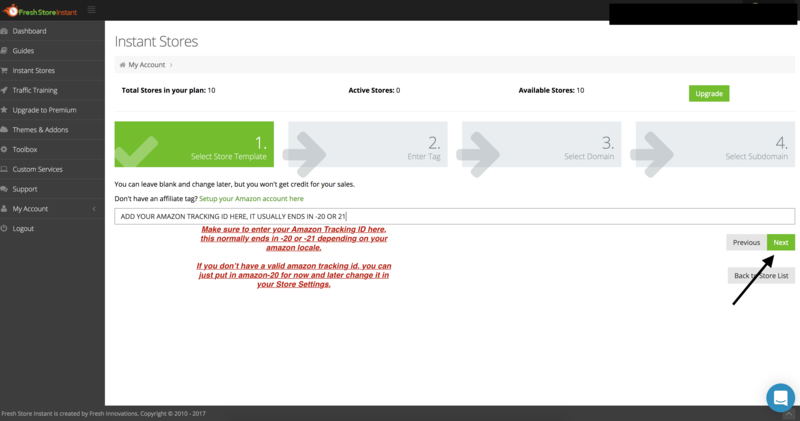 Then you can go back to “ADD NEW STORE” and quickly import one of the 10 Second Stores or start with a blank store. HOW TO LOGIN TO YOUR NEW STORE AND HOW TO DELETE A STORE. Once you have installed your FSI stores, you can quickly login to each store and manage it from the 'My Stores' - View Stores tab. "Store Details" = If you click this button, it will take you to the settings page for that store. 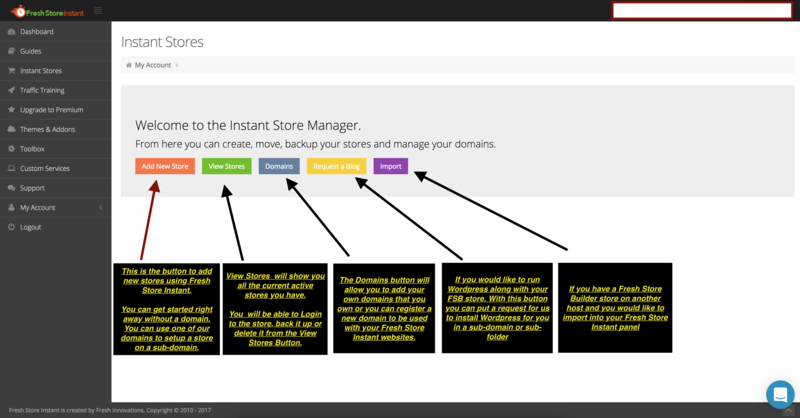 You will be able to backup the store, delete the store or change the domain name for that store. 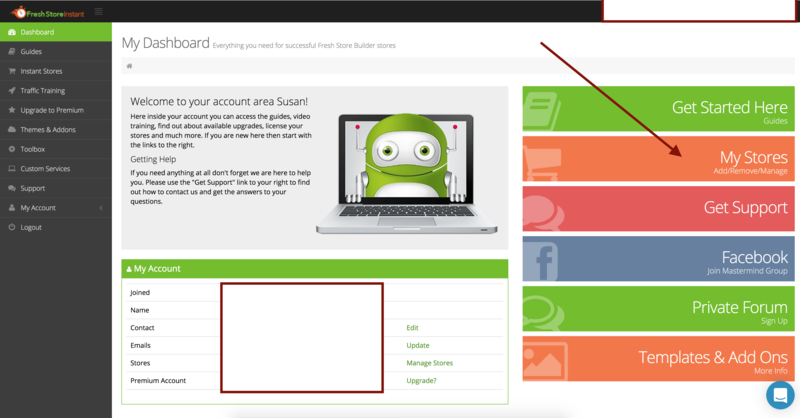 "Login" = This will log you into the Freshadmin control panel for that store. 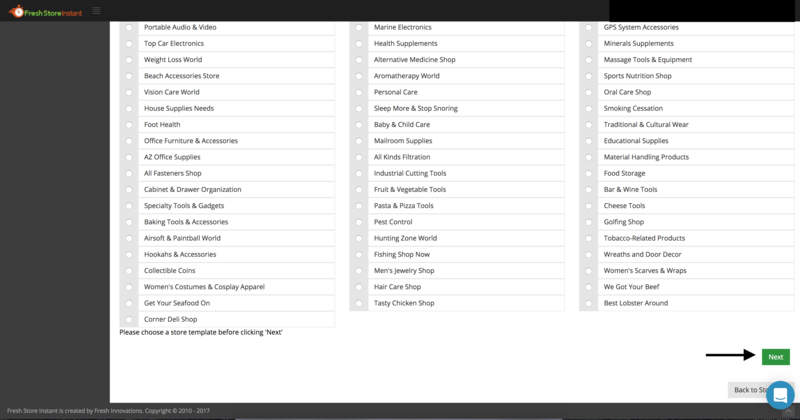 This is where you will be able to edit your store, add new categories, products or any changes you like to do. WHERE TO GO AFTER I HAVE CREATED MY FIRST FRESH STORE INSTANT WEBSITE. Once you have installed your stores and are able to login then you are ready to start working on your website. It looks like the image shown below. You can use this guide website to access guides on anything relating to your Fresh Store Instant store. 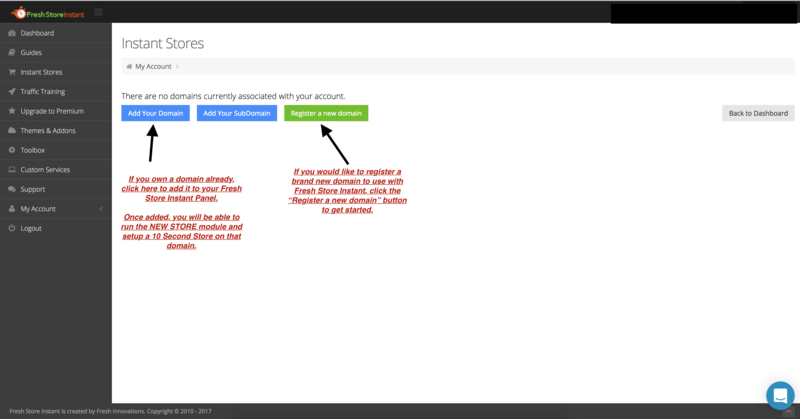 PLEASE BEWARE THAT THE GUIDES SHOWN FOR FRESH STORE BUILDER ALSO APPLY FOR THE FRESH STORE INSTANT STORES. 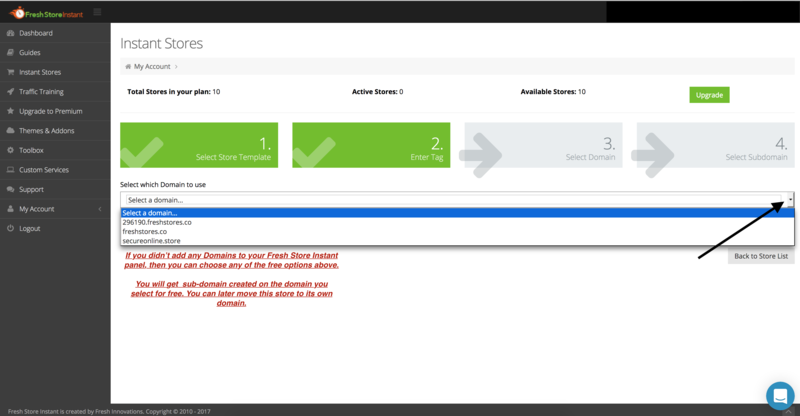 So make sure to check the Fresh Store Builder section out for any questions you might have on features in the script. 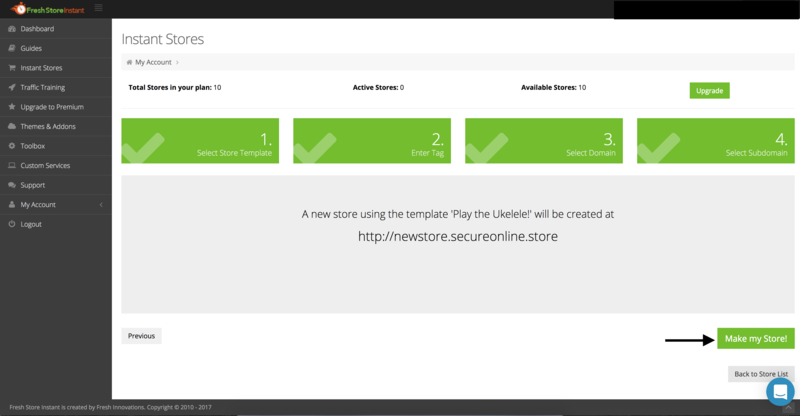 Steps to Enable HTTPS on your FSI store . After 24-48 hours you are ready to set your FSI store to HTTPS. 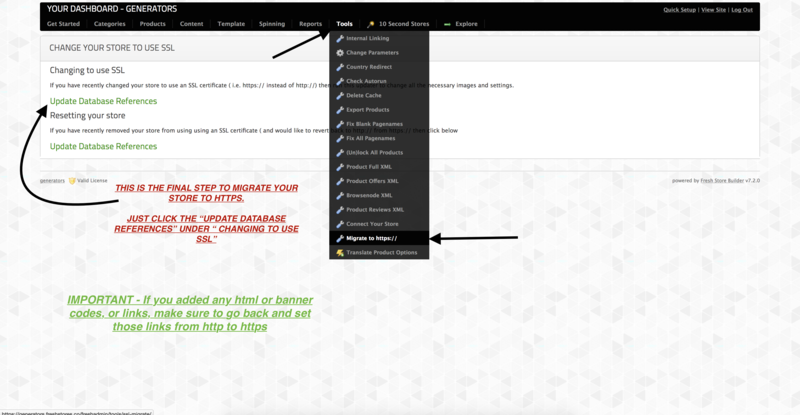 Login to your FSI freshadmin panel and change your Site URL and then run the Migrate to HTTPS module.